How would you determine that the price at which you are selling goods or services to your US subsidiary or branch is acceptable to both Canadian and US tax authorities? 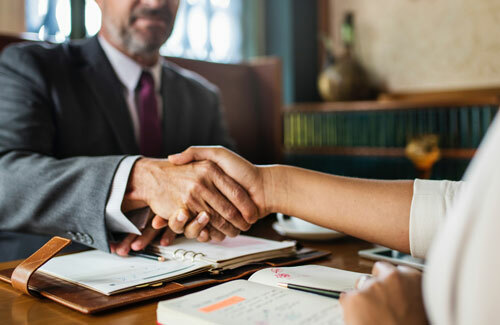 Essentially, any transaction between a related Canadian and overseas enterprise must successfully pass the test of arm’s length pricing under Transfer Pricing (‘TP’) regulations of Canada. Compliance with TP regulations has been an important task for the CFOs of multi-national enterprises. The CFOs are having a greater responsibility to ensure that their inter-company pricing policies commensurate with the local regulations of each jurisdiction they operate in. enterprises. The Organization for Economic Cooperation and Development’s (‘OECD’s) along with G7 countries have come out with newer reporting standards contained in Base Erosion and Profit Shifting (‘BEPS’) action plans. These standards require a greater transparency in the reporting of inter-co transactions. Transfer Pricing refers to the setting-of prices between related cross-border enterprises involving the transfer of property or services. These transactions are also referred to as “controlled” transactions, as distinct from “uncontrolled” transactions, which are between enterprises that are not related and operate independently (“on an arm’s length basis”). Example 1: The parent company in Canada (CanCo) provides administrative services and technical services to its subsidiary company in the US (USCo). The USCo pays $100,000 for the services provided by its parent company CanCo. 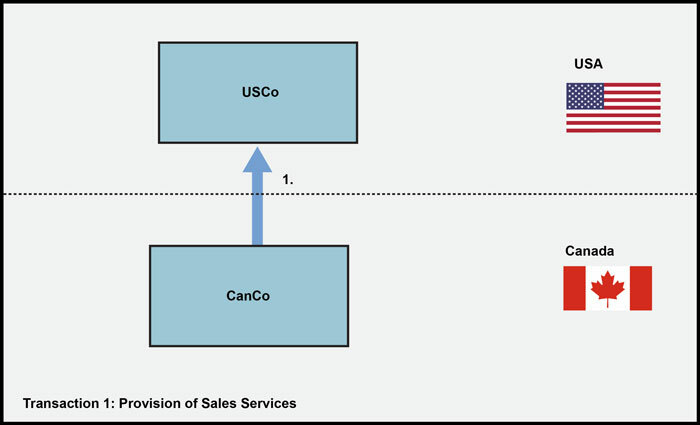 Example 2: The parent company in US (USCo) has a subsidiary company in Canada (CanCo). CanCo acts as a sales office for its parent company USCo. CanCo sells the goods transferred from USCo and charges a commission for the sales services provided in Canada. Example 3: The parent company in Canada (CanCo) has a subsidiary company in the US (USCo). Both companies (CanCo and USCo) are operating separately and except one transaction, do not have any other intercompany transaction. 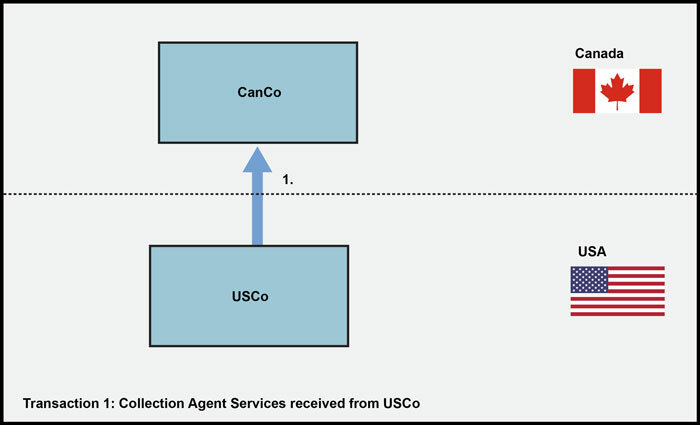 USCo sometimes collects funds from CanCo’s customers in the US on behalf of CanCo as a collecting agent. CanCo pays 5% of the total amount as collection fees to USCo as its fee for the services. 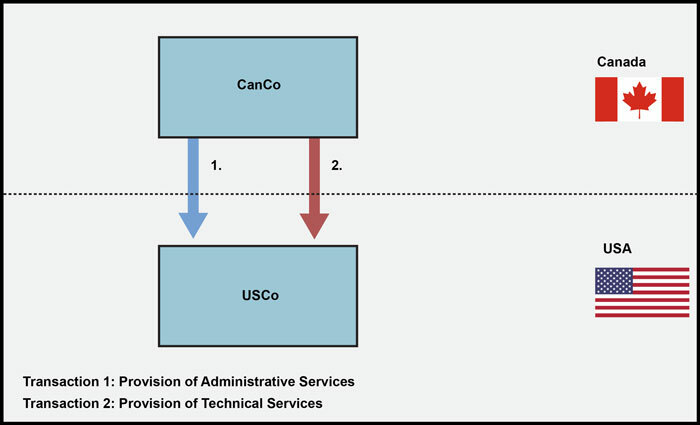 In all the above examples, the transaction between CanCO and USCo has to meet the arm’s length standard of both the countries, i.e. Canada and the U.S. respectively. Arm’s length principle defines the price at which uncontrolled enterprises deal with each other, and market forces ordinarily determine the conditions of their commercial and financial relations. The arm’s length principle provides that the terms and conditions between the parties should be identical, whether the enterprise is dealing within the MNE Group or outside of the MNE Group. Canadian transfer pricing regulations require that related party transactions occur under the arm’s length conditions. the parties enter into a transaction or series of transactions. Application of the arm’s length principle is generally based on a comparison of prices or profit margins of the related parties with those of the unrelated parties engaged in similar transactions. In examples above, the two entities would fall within the purview of the Canadian transfer pricing regulations, since there are cross-border transactions between them and CanCo is a taxpayer for Canadian tax purposes and the two entities are related to each other, and considered not to be dealing at arm’s length. The focus of transfer pricing provisions is the determination of the arm’s length price. CRA relies on the transfer pricing methods set out in the Information Circular 87-2R (“IC 87-2R”) and the OECD Guidelines. The selection of one of the above methods for determination of the arm’s length price could be challenging. The OECD guidelines provide that, based on the analysis, the most appropriate method should be selected. In IC87-2R, the CRA states that the methods form a hierarchy with the Comparable uncontrolled price method being more reliable than the Resale price method and Cost-plus method, and those three methods being more reliable than the bottom two. Nonetheless, the CRA concedes in IC87-2R that “the most appropriate method in a given set of circumstances will be the one that provides the highest degree of comparability between transactions”. The Canadian income tax regulations require the taxpayers to keep records of related party transactions with non-residents along with the documentation demonstrating that the taxpayer has determined and used arm’s length prices. The transfer pricing documentation usually includes inter-company agreements, copies of invoices and payments, details of any intangibles and any fee paid for the use of such intangibles, details of any cross-charges or management fees, selection of most appropriate method, industry and economic analysis and any adjustments done by the taxpayer to conform to the arm’s length prices. A taxpayer is deemed not to have made “reasonable efforts” to determine the arm’s length prices unless the taxpayer has maintained the prescribed information and analyses in the form of contemporaneous documentation, as explained in TPM-5R. The due date to prepare or obtain contemporaneous documentation is the due date for filing the income tax return by the corporation, trust, individual or partnership. Taxpayers are required to update the documentation for any material changes and provide the documentation to the CRA within three months of a written request. Canadian Income Tax Act now includes regulations relating to country-by-country (‘CbC’) reporting, in line with the OECD’s newer reporting standards contained in BEPS action plan 13. The CbC report is a template for MNE groups to report annually for each tax jurisdiction where they do business. MNE groups with more than €750 Million in consolidated group revenue in the immediately preceding fiscal year have to file a CbC report, which is due 12 months after the last day of the reporting fiscal year. Canadian income tax regulations allow the Canada Revenue Agency (CRA) to audit the inter- company prices determined by the taxpayers. CRA can adjust a taxpayer’s transfer prices where the CRA concludes that the transfer prices do not reflect the arm’s length pricing. When the CRA has made a transfer pricing adjustment, it can also impose penalties in circumstances where the taxpayer has failed to prepare and maintain contemporaneous documentation in support of the prices received or paid. Transfer pricing adjustments that result in a net increase in income or a net decrease in loss, are subject to a 10% penalty, with the exceptions where the net transfer pricing adjustments do not exceed 10% of the taxpayer’s gross revenue or C$5 Million. However, it should be noted that the penalties will not apply where the taxpayer has made reasonable efforts to determine and use arm’s length prices and documented all the details by the due date of its tax return for that year. TPM-09 issued by the CRA can be referred to understand CRA’s administrative positions on the meaning of “reasonable efforts”. Canadian Income Tax Act also provides the CRA with the power to “recharacterize” transactions in certain circumstances. TPM-13 – Referrals to the transfer pricing review committee (TPRC), issued by the CRA can be referred to understand CRA’s guidelines for referrals to TPRC regarding possible transfer pricing assessments under Canadian Income Tax Regulations. Form T1134 – Information return relating to controlled and non-controlled foreign affiliates must be filed for each foreign affiliate (non-resident corporation or non-resident trust) of the taxpayer or partnership that is either a controlled foreign affiliate or a non- controlled foreign affiliate. Form T106 – Information return of non-arm’s length transactions with non-residents is an annual information return where a reporting person (corporation, trust or individual) or partnership reports its non-arm’s length activities with non-residents. OECD Transfer Pricing Guidelines for Multinational Enterprises and Tax Administrations – Canadian transfer pricing legislation and administrative guidelines are generally consistent with the Organization for Economic Co-operation and Development (OECD). 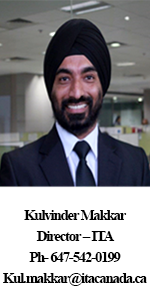 Kul Makkar – Kulvinder works with International Tax Advisors (‘ITA’) Canada. He is a Certified Public Accountant (‘CPA’) from the American Institute of Certified Public Accountants, USA and a Chartered Accountant (‘CA’) from the Institute of Chartered Accountants of India. He has expertise in: planning and negotiating Advance Pricing Agreements, Planning and advising MNCs’ on Country-by-Country Reporting, transfer pricing studies for MNCs in Canada,India and USA, Planning and developing Business Models for tax optimization, Guiding on accounting system and codes. 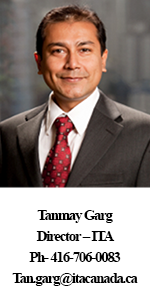 Tan Garg – Tanmay is a Director at International Tax Advisors Canada. He has expertise in conducting transfer pricing studies for MNCs and providing audit assistance to several MNCs in Canada, India, UK and the US. Tanmay has extensive experience in managing transfer pricing projects across various industry sectors, such as food processing, pharmaceutical, software & ITES, mining, telecom, payday loan, wealth management and other miscellaneous industries. Do I Have to Pay Tax on a Company Car? Can a Health Spending Account (HSA) save my business money?